[123 Pages Report] The service market for data center market size is estimated to grow from USD 39.68 billion in 2017 to USD 77.51 billion by 2022, at a Compound Annual Growth Rate (CAGR) of 14.33%. The rise in data center technology spending, the requirement to reduce data center operation cost, and rising data center complexities are the major growth drivers of the service market for data center. In this study, 2016 has been considered as the base year and 2017-2022 as the forecast period. Data center owners are increasingly becoming considerate of the CAPEX spent on commissioning mission-critical data center facilities and are looking for ways to reduce cost and improve Return on Investment. Data center services, such as consulting provide the required feasibility consulting and cost estimation required for setting up new data centers. Moreover, these services provide for risk assessment and optimum ROI. Services such as training and development help in generating awareness regarding the best data center practices, thereby further improving the efficiency of data center professionals and increasing the ROI. In addition, data center support and maintenance services help in reducing the downtime and failure, thus further lowering unwanted OPEX and improving ROI. These added benefits of data center services are expected to propel the global service market for data center over the forecast period. The main objective of this report is to define, describe, and forecast the global service market for data center on the basis of service type, tier type, end-user, data center type, industry, and regions. The report provides detailed information regarding the major factors influencing the growth of the market (drivers, restraints, opportunities, and industry-specific challenges). The report aims to strategically analyze micromarkets with respect to individual growth trends, prospects, and contributions to the total market. The report attempts to forecast the market size with respect to five main regions: North America, Europe, Asia-Pacific (APAC), Middle East & Africa (MEA), and Latin America. The report strategically profiles key players and comprehensively analyzes their core competencies. This report also tracks and analyzes competitive developments such as joint ventures, mergers & acquisitions, new product developments, and Research & Development (R&D) activities in the service market for data center. The service market for data center ecosystem comprises vendors such as HPE (U.S.), IBM (U.S.), Schneider Electric SE (France), Cisco Systems, Inc. (U.S.), Dell, Inc. (U.S.), Fujitsu Ltd. (Japan), Vertiv Co(U.S.), Hitachi Ltd. (Japan), Equinix, Inc. (U.S.), and Huawei Technologies Co. Ltd. (China); service providers; system integrators; and enterprises. What are new industry which the data center service providers are exploring? Further breakdown of the North America service market for data center. Further breakdown of the Europe service market for data center. Further breakdown of the APAC service market for data center. Further breakdown of the MEA service market for data center. Further breakdown of the Latin America service market for data center. The service market for data center is estimated to grow from USD 39.68 billion in 2016 to USD 77.51 billion by 2021, at a high Compound Annual Growth Rate (CAGR) of 14.33% during the forecast period. Data center down time or any minimal interruption may cause huge loss to the organization. Data center services such as design & consulting, installation & deployment, professional services, training & deployment, and maintenance & support are important for the efficient functioning of data center facilities. These services are fueling the growth of service market for data center as organizations are increasingly adopting data center services to ensure maximum uptime and uninterrupted data center functioning. The report provides detailed insights into the global service market for data center, which is segmented according to the type of services, tier types, end-users, data center types, industries, and regions. 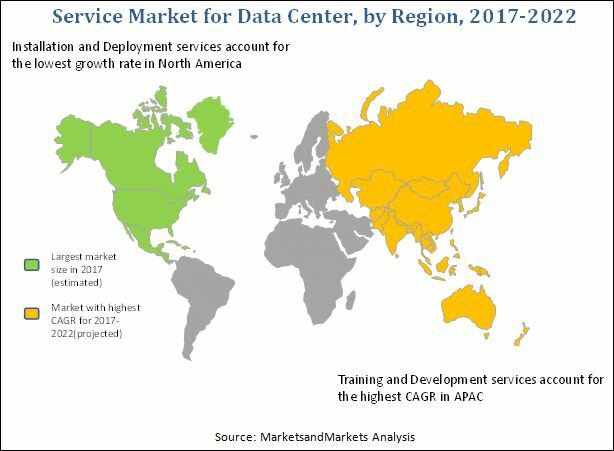 In the type of service segment, professional services are expected to dominate the service market for data center and contribute the largest market share, whereas, training & development is set to grow at the highest CAGR during the forecast period. The tier type segment includes tier 1 to tier 4 type of data centers, where tier 4 type of data center is estimated to have a higher market size as it has advanced functionality used by large data centers. Growing investments in data center technologies across the world and increasing number of data centers are further demanding for services and fueling the growth of the service market for data center. BFSI is a sector characterized by digitization, and the increasing number of customers that are using various banking applications has resulted in exponential growth of data in the banking and financial services industry. Data centers are increasingly becoming an important part for banking and financial industry, as the industry requires effective management of crucial data. Additionally, BFSI handles thousands of virtual machines and physical servers. Moreover, they have several monitoring tools that need to deal with various challenges such as optimizing resource allocation, reducing processing times and maintaining data center uptimes on a daily basis. In the sector, numerous transactions are being processed every minute, and any disruption can cost billion dollar losses. The BFSI industry is continuously in need of efficient data center services that can assist in daily operations. Data center service providers help the organizations in increasing speed, improving flexibility, and alleviating risks, resulting in increasing demand for these services in the BFSI industry. Advancements in communication technology have paved the way for high-reliability, long-life, and application-ready computing solutions to handle and store data traffic originating from signals and other data streams. Growing communication technology has had a positive impact on the IT and telecom industry. The IT and telecom industry is therefore in need of data centers to store the ever-increasing data. The IT and telecom industry is characterized by ever-increasing demand, which is accompanied by a sudden expansion in the data center infrastructure and related resources. This growing demand for effective services is expected to cause a surge in the overall services market for data centers. The government and defense sector faces challenges in creating a multi-channel business application, ensuring license renewal on time, streamlining procurement process while on-boarding with new trading partners, and maintaining accurate real-time location & inventory usage. The growing number of government initiatives toward digitization of information has caused an increase in the number of data centers utilized by government and defense industries all over the world. Additionally, increasing requirement for information security and availability has led to an increase in demand for efficient, scalable, and secure data centers. The government and defense industry has adopted various initiatives. The service market for data center is gaining traction in the government and defense sector, as it helps in massive cost reduction, high Return on Investment, timely processing, and high performance. What are the upcoming industry trends in service market for data center? The report covers all the major aspects of the service market for data center and provides an in-depth analysis across the regions of North America, Europe, Asia-Pacific (APAC), the Middle East & Africa (MEA), and Latin America. The market in North America is expected to hold the largest market share. Due to the presence of various developing countries, growing number of data centers, and an increasing adoption associated services, the APAC region is projected to have great opportunities in this market and would grow at the highest CAGR by 2022. However, increasing prevalence of third-party service providers may act as the restraining factor for the market. Various vendors are providing data center services that help enterprises in reducing their CAPEX and OPEX. Dell is one of the major vendors that offer professional services to manage and maintain the IT environment and provides services that assist platform transitions. The company has extensively focused on developing data center services that can help to transform data centers in a cost-effective and secure way. Other vendors include HPE (U.S.), IBM (U.S.), Schneider Electric SE (France), Cisco Systems, Inc. (U.S.), Dell, Inc. (U.S.), Fujitsu Ltd. (Japan), Vertiv Co(U.S.), Hitachi Ltd. (Japan), Equinix, Inc. (U.S.), and Huawei Technologies Co. Ltd. (China). These players adopted various strategies such as new product launches, partnerships, collaborations, and expansions to become competitive in the market.